The championship has passed in the terms established by the planned schedule. 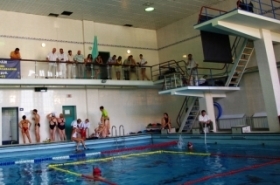 Organizers have given the swimming pool the necessary requirements of international rules CMAS of aquathlon for carrying out of the championship. National federations of Russia and Croatia had affiliation in the commission aquathlon CMAS prior to the beginning of competitions. National federations of Israel, Ukraine, Belarus, Lithuania have paid for affiliation directly before of competitions in Kazan. National federations of the USA, Sweden, Montenegro and Italy which have paid affiliation earlier in the commission aquathlon CMAS, unfortunately did not participate in this competition. I would like to call your attention to the lack of CMAS medals in this competition, though they have been ordered. Organizers of competitions have urgently made medals, but they differed from official medals CMAS. Competition was broadcasted with various mass media. Federal channel Star Efir and Tatarstan channel; Russia 1. Russia 2. Russia 24. TNN. TNT. Cable channels and others. Federal and local newspapers, magazines and radio. The camera had broadcasted on the screen for spectators have been established underwater. Unfortunately, organizers did not succeed to record underwater part of the competition due to technical problems. Photo materials about CMAS Aquathlon European Championship Open and protocol are applied.